Vijayalakshmi (Viji) Das began her career in financial inclusion in 1989 with inspiration from her mother and grandmother, who both broke social norms and took on jobs in a society where women were traditionally not allowed to do so. Viji was also exposed to women in Ahmedabad who were taking leadership roles in organizing women. Viji began her career working for the corporate sector as a management consultant and soon joined Friends of Women’s World Banking India (FWWB India), an organization focused exclusively on promoting low-income women’s access to financial services and nurturing women’s collectives through loan and capacity building support. 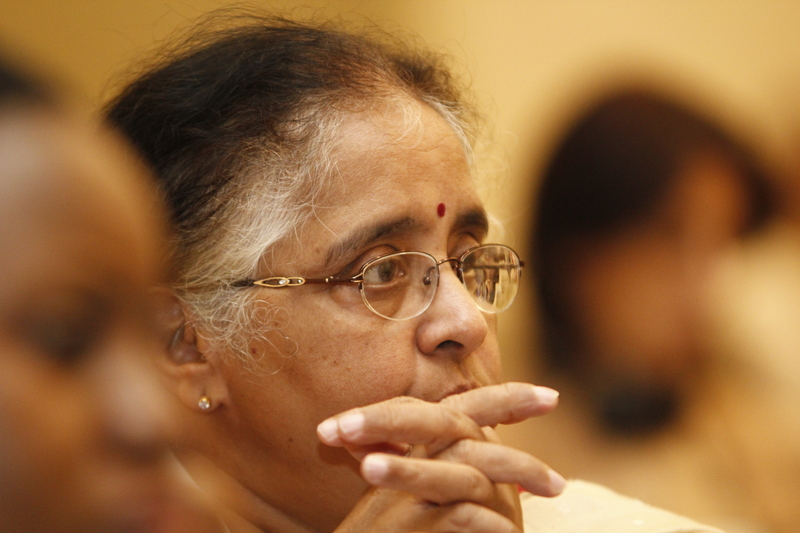 The founder of FWWB India, Ela Bhatt, became Viji’s long time mentor. Ela is a pioneer in women’s empowerment who established the SEWA Co-operative Bank in the early seventies, which in turn promoted FWWB India in 1982. Viji remembers the first loan she disbursed from FWWB India to an informal women’s collective and how inspired she felt when the women repaid their loan two months before the due date. Indeed, she finds that across India women have a 100 percent loan repayment rate. To this day, traveling around the country, Viji finds that while women are diverse across India’s cultures they share confidence, commitment and a willingness to take risk. Starting as a coordinator and eventually becoming CEO of FWWB India, Viji played an instrumental role in defining the organization’s strategic positioning, developing its first business plan and building a committed team. Led by a Board of Women Leaders, of which Viji remains a member, FWWB India operates as an “apex” organization committed to building a network of strong institutions across India providing financial services to low-income women. These organizations combine loans with technical assistance to ensure the sustainable growth of microfinance institutions. Between 1989 and 2010, they reached more than 300 organizations with technical assistance and nearly 200 with loan support. By March 2010, FWWB India had made a cumulative disbursement of approximately 11 billion rupees, benefitting 2.6 million women. With Viji’s leadership, FWWB India established Ananya Finance for Inclusive Growth (Ananya) to serve as a dedicated entity for microfinance in 2009. As Ananya’s managing director, Viji continues her passion to serve more low-income women with microfinance by accessing a larger lending book and capital base due to Ananya’s license from the Reserve Bank of India to operate as a non-banking finance company. Reflecting on women’s leadership, Viji says “women should become natural leaders where they are working.” As she has watched women take on leadership roles in collective savings and credit groups, at the household level and in her own experience at FWWB India and Ananya, Viji believes that having women in leadership roles is key to ensuring that the specific needs and aspirations of other women—both as clients and staff—are heard and addressed.